In Bee, who is a few weeks short of her 20th birthday, is the youngest US Women’s Open Champ ever. The youngest winner of the US Open before today was South Korea’s Se Ri Pak. Pak winning the 1998 US Open. In Bee like so many of the other players from the ROK say Se Ri Pak and her success on the LPGA was what inspired them to play pro golf. *- Annika Sorenstam holed her approach on 18 for what COULD BE her final shot in US Open history. She hitting a 6-iron into the cup from 199 yards. What a way to go out if Sorenstam doesn’t play in the Open again. *- Stacy Lewis shot a final round 78 today. To be honest, I don’t think she lost the tournament. Lewis played play as bad as her score says because the conditions today were tough. Winds blowing at times 20-30 MPH. I’m predicting Lewis will be back in contention for a LPGA victory within a year. *- Lewis’ winnings today won’t count towards the sum she needs to gain a spot on the LPGA Tour. See the tour doesn’t count money at the US Open when determining if a player exceeded the amount required. When asked who set this policy, an NBC announcer(I think Dottie Pepper) said ‘no comment’. *- There’s another LPGA policy I’m going to question in a post tomorrow or later this week. 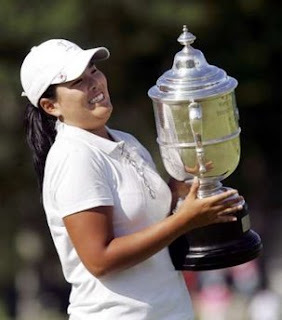 Should a Naturalized US citizen(Angela Park) be allowed to compete for a Solheim Cup spot? LPGA policy at this time doesn’t allow it. The screwball thing is, a Naturalized citizen can qualify for the Curtis Cup(and has at least once) and the Junior Solheim Cup! If they can play for the Junior, why not the professional then? I’ll address this and the reasons given for the policy. *- Paula Creamer collapsed today. I’m not going to speculate on why she can’t bring home a major yet. Stu at The Waggleroom compared Paula’s collapse to Greg Norman’s at the 1996 Masters and Michelle Wie at the 2005 Women’s US Open. I think I got a better comparison. Gary Player’s final round 77 at the 1978 US Open. Why do I say this? B- Creamer and Player both finished tied for 6th in the tournaments I’m comparing. Norman finished 2nd, Wie out of the top 10. Norman had won majors before the 96 Masters. Wie hadn’t won tour, major or otherwise. I think Player in 78 is a better analogy to Creamer today than either Wie or Norman. *- I don’t recall Johnny Miller making any insulting comments today but he did make a clueless comment. Towards the end of the round Miller saying women’s golf is more popular in South Korean than men’s golf. It’s been that way since Se Ri Pak won the LPGA Championship in 1998 at least. Where has Johnny Miller been the last ten years? To close I’ll quote what AP’s Doug Ferguson said in the concluding paragraphs of his coverage of today’s final round. There were so many possibility for great story lines going into the final round â€” Lewis and her remarkable recovery from back surgery that almost ended her career before she got to college; Creamer, looking poised to finally get a major to go with her marketing campaign; Alfredsson, who blew a six-shot lead at the Women’s Open in 1994, now with a chance for redemption at 43. There were many potential story lines today but Inbee certainly did steal the show. She was a deserving US Open champ and she will be in the winner’s circle again.